Now, more than ever, it is important for businesses working at the forefront of the seniors living sector to come together and discuss how we can all make sure that we create holistic and highly functional spaces for seniors that support commercial efficiency as well as physical and emotional wellbeing. The Leaders Summit is an annual conference that brings the leading providers, thinkers and industry strategists together in one place for two days that are focused on the business of doing business in the retirement living and care sectors, with an emphasis on business strategy as well as meaningful networking opportunities. Crosier Scott is sponsoring the summit and will be in attendance this Thursday and Friday. Come and see us to hear more about how we are designing the future of Seniors Living. or contact us at seniorsliving@croscott.com.au to organise a catch-up. 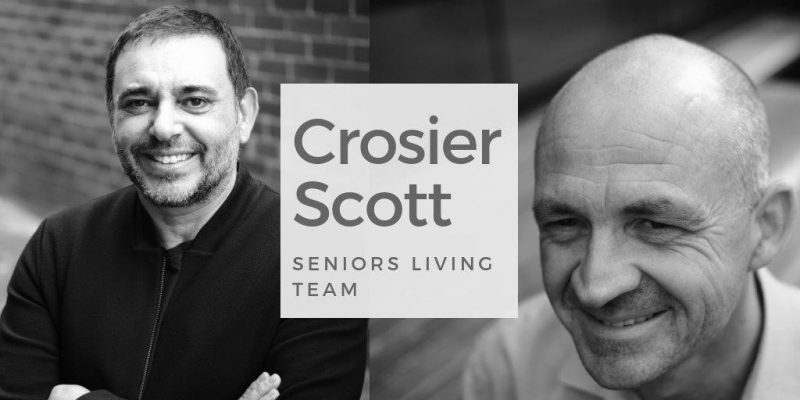 Crosier Scott has long been a major contributor to the Seniors Living Sector. This takes the form of built work as well as ongoing research into contemporary built solutions, integrations and co-locations that support the commercial needs of providers as well as the wellbeing, lifestyle and amenity requirements of an increasingly young and active generation of seniors – achieved by implementing smart design solutions. Read more here. If you are attending the Summit, these are the faces you’ll see representing Crosier Scott. Shilo de Bono (L) and Alan Cubbon (R) are passionate advocates for providing the best possible built solutions to support a healthy lifestyle and resident wellbeing through smart architecture. They will both be on hand throughout the Summit to discuss architectural solutions for Seniors Living projects and how Crosier Scott are designing the future of Seniors Living today.